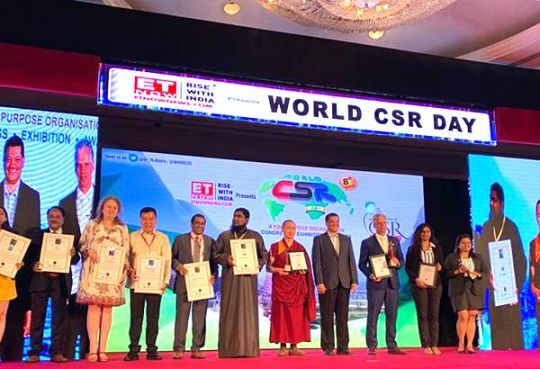 Geshe Tenzin Zopa and fellow World CSR Day award recipients, Mumbai, India, February 2019. Photo courtesy of Geshe Tenzin Zopa. 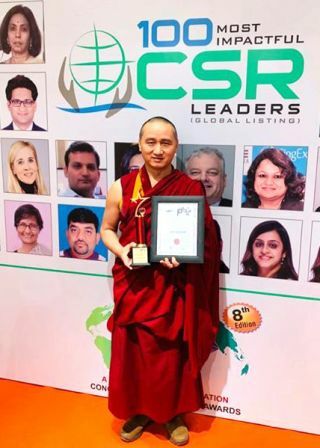 Geshe Tenzin Zopa, an FPMT touring teacher, was awarded the Global Peace Leadership and Excellence Award by World CSR (corporate social responsibility) Day organizers on the occasion of World CSR Congress’s eighth annual celebration of World CSR Day on February 18, 2019. The one-day World Peace Congress—held in conjunction with World CSR Congress—was held at hotel Taj Lands End in Mumbai, India. The mission of World Peace Congress is to bring together experts with solutions to major issues occurring in our personal lives, homes, schools, businesses, and communities. World Peace Congress staff created a shortlist of candidates for the award. Final award decisions were made by a jury comprised of Dr. R. L. Bhatia, Founder of World CSR Day and World Sustainability; Dr. Saugata Mitra, Chief People Officer and Group Head HR, Mother Dairy Fruit & Vegetable Pvt. Ltd; Professor Indira Parikh, President of Antardisha, and India’s Iconic HR Leader; Dr. Arun Arora, Ex-President and CEO, The Economic Times, and Chairman, Edvance Pre-schools Pvt. Ltd; and Dr. C. M. Dwivedi, Group Chief Human Resource Officer, Fazlani Group of Companies; as well as juries located in each candidate’s geographic region. 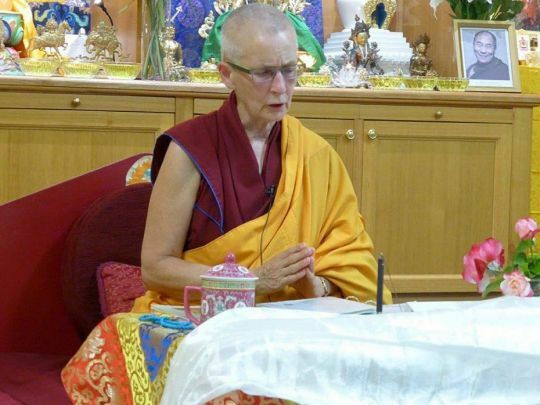 Stephanie Brennan, FPMT Australia national education coordinator shares the story. On February 18, 2019—the eve of Chotrul Duchen and the completion of Monlam Chenmo—Geshe Tenzin Zopa was awarded the prestigious Global Peace Leadership and Excellence Award in Mumbai, India. The World Peace Congress brought together citizens from over 130 countries to celebrate leaders who are building a better society and a more peaceful world. 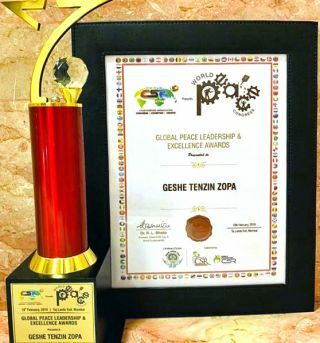 A global jury of leaders from the fields of sustainable development, education, and world peace chose Geshe Tenzin Zopa for the award in recognition of his leadership and contributions to society. Geshe Tenzin Zopa was invited to give a presentation “Peace as a Purposeful Goal and Sustainable Peace Effort.” He spoke of the need for secular ethics to be taught in our educational institutions, our interconnectedness, the need to cherish others, universal responsibility, and the need to develop love and compassion. He said His Holiness the Dalai Lama can inspire us to see that individuals can resolve problems, and how we can all contribute to global peace. Geshe Tenzin Zopa with his award certificate and trophy, Mumbai, India, February 2019. Photo courtesy of Geshe Tenzin Zopa. Geshe Tenzin Zopa shared his thoughts following the event. If you were to ask me how I feel about this acknowledgment then I would answer with this: it is truly due to the blessing of my gurus and all the sentient beings’ immeasurable compassion and kindness towards me. When I got the invitation and information about this award, at first I thought it was a scam. I didn’t believe it right up until the booking of the flight, which was just a few weeks before I arrived in Mumbai from Sydney after my teaching tour. In fact, until it was my turn to be called up to the stage I was still thinking, ‘I’m here for the conference only, not as a recipient of the award,’ because the people who went onto the stage for the awards were well-known great leaders of corporate social responsibility from around the world who have achieved great works, and I am not in that category at all. Anyway, it was a very auspicious surprise. I was humbled to start the year knowing that in the larger non-Dharma community people are paying great attention, taking note of and appreciating one simple Buddhist monk, and are offering this award as acknowledgment, encouragement, and inspiration to work harder for the greater cause of peace and happiness of humanity to one’s best ability. It was surprising and humbling to know that it still counted and was appreciated by many who love peace—as long as it is an effort for peace and harmony, even if it is coming from a nobody like me, who is no different from an ant. Geshe Tenzin Zopa’s award certificate and trophy, Mumbai, India, February 2019. Photo courtesy of Geshe Tenzin Zopa. This event made me realize that the work I have been acknowledged for has not been done yet. But I pray to do these acknowledged works of peace for the happiness of humanity—unconditionally—for the rest of my life to the best of my ability, as long as it is the cause for the peace and happiness of humanity and all living beings. Whatever has happened and whatever is going to happen is all due to the blessings of the guru Buddhas and all mother sentient beings. I sincerely dedicate this award and any virtuous deeds in relation to this event for the perfect health, long life, and fulfillment of all holy aspirations of His Holiness the 14th Dalai Lama, Kyabje Lama Zopa Rinpoche, and all the gurus. And also may it be the complete cause of temporary and ultimate happiness of all living beings. Ven. Lobsang Konchok with a son of the previous Imam and Andrew, Hobart Mosque, West Hobart, Tasmania, March 2019. Photo courtesy of Chag Tong Chen Tong Centre. 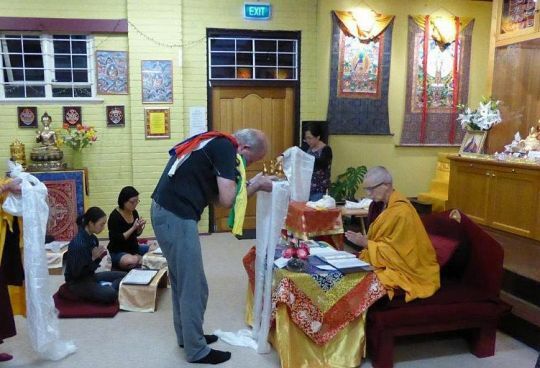 On March 18, 2019, three days after the Christchurch, New Zealand, shootings at Al Noor Mosque and Linwood Islamic Centre, members of Chag Tong Chen Tong Centre, an FPMT center in Hobart, Tasmania, Australia, visited their former home, Hobart Mosque in West Hobart, Tasmania. There, they greeted a son of the previous Imam and their old friend Andrew, a Hobart Mosque community member and full-time volunteer groundsman. 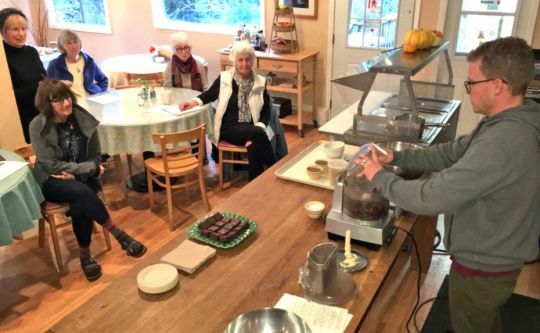 Interfaith activities are one of FPMT’s five pillars of service. Ven. Lindy Mailhot, center director shares the story. 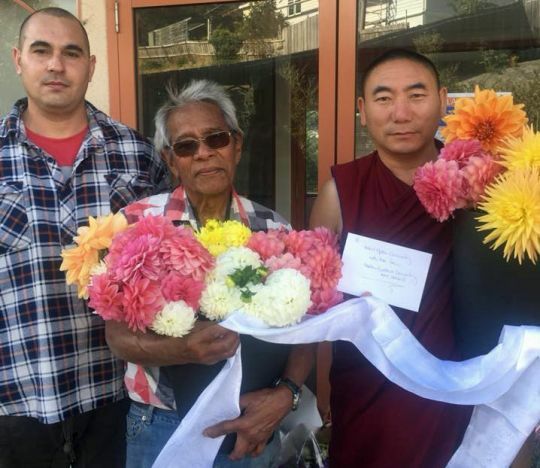 We visited the Hobart Mosque on March 18—offering freshly picked flowers from the gardens that surround the Chag Tong Chen Tong Centre (CTCT) gompa and extending our hearts, prayers, love, and care for our Muslim brothers and sisters on behalf of the CTCT Tibetan Buddhist community at this very tender time. It was an especially moving experience for us to return and meet with our friends again at the Hobart Mosque. CTCT had enjoyed many years—some just part-time room rental, and then almost two-and-a-half years of full-time rental—of the eight-room Victorian house, which had been modified for use as a mosque. These modifications included beautiful religiously-themed stained-glass panels around the doorway. The Hobart Mosque community made their old mosque building available for rental after they built a bigger mosque on the same property in 2004. Tenzin Phuntsok Rinpoche and Geshe Tenzin Zopa outside of Hobart Mosque, West Hobart, Tasmania, August 2015. Photo by Chris Aimes. We always shared a lovely harmony with the Hobart Mosque community. During our recent visit they told us how much they miss having our center community there with them since we relocated a couple of years ago due to our financial circumstances. The Hobart Mosque is the venue where we welcomed the very first most precious, especially blessed and unforgettable two-day visit of Tenzin Phuntsok Rinpoche and Geshe Tenzin Zopa to CTCT in August 2015. 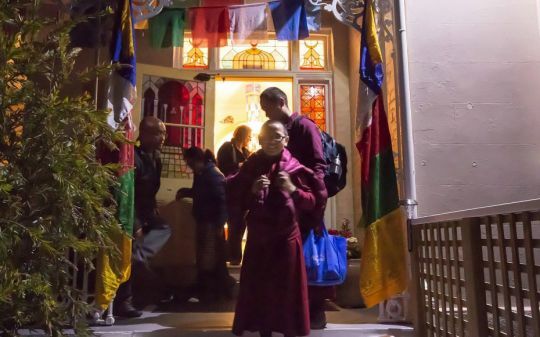 Tenzin Phuntsok Rinpoche and Geshe Tenzin Zopa entering Hobart Mosque, West Hobart, Tasmania, August 2015. Photo by Chris Aimes. Ven. Ngawang Wangmo, Emily Coleing, Ven. 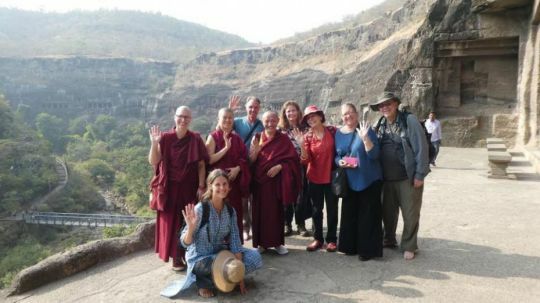 Thubten Pema, Mark Reid, Geshe Ngawang Rabga, Drolkar Maree, Annie McGhee, Sharon Dobson, and Pierre Yves at Ajanta Caves, Maharasthra, India, December 2018. Photo courtesy of Pierre Yves. 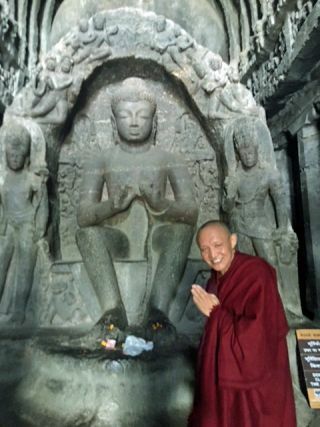 In December 2018 a group of pilgrims organized by FPMT center Root Institute for Wisdom Culture in Bodhgaya, Gaya District, Bihar, India, traveled together to the Ajanta and Ellora Caves in Aurangabad District, Maharashtra, India, with Geshe Ngawang Rabga, Root Institute’s resident geshe. Trip leader Annie McGhee shares the story. A group of nine of us left Root Institute early one morning to Delhi. It was very special to have Geshe Ngawang Rabga with us as part of our group of nine. He is extremely humble, knowledgeable, charismatic, gentle, warm, and incredibly kind. We spent the next day visiting the National Museum where a superb stupa holds relics of Shakyamuni Buddha. The museum also has many objects from the Dunhuang Caves of a Thousand Buddhas in Gansu Province, China. 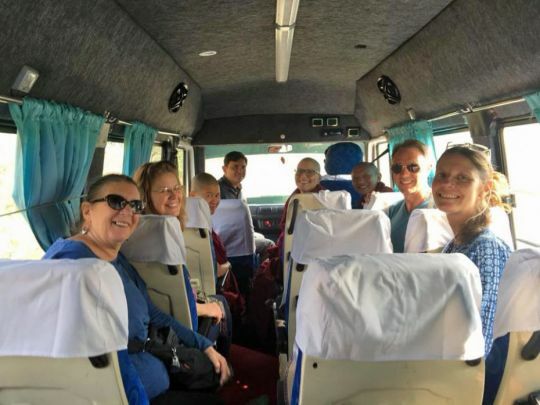 We stayed two nights in Delhi, then after a short flight south to Aurangabad, we traveled by mini bus up to Ellora, where we stayed for several nights. Mini bus ride over dusty bumpy roads, Maharasthra, India, December 2018. Photo by Pierre Yves. Recognized as a World Heritage Site by UNESCO in 1983, the Ajanta Caves are some of the finest and most extensive surviving examples of ancient Indian art, architecture, and sculpture. Only a few hours from the city of Aurangabad, twenty-nine immense caves are nestled in a huge gorge in the shape of a horseshoe. Dating from the second and first centuries B.C.E. to the fifth and sixth centuries C.E., the Ajanta Caves consist of viharas (monasteries) and chaitya (prayer halls) of different Buddhist traditions, which were carved into a 250 foot (76 meter) wall of rock. Geshe Ngawang Rabga at Ajanta Caves, Maharasthra, India, December 2018. Photo by Annie McGhee. We saw cave walls and ceilings adorned with paintings. Among the most interesting paintings are the Jataka tales, illustrating diverse stories relating to the previous incarnations of the Buddha as various bodhisattvas. We did prayers and meditated within the quiet solitude of some of the caves. There was a palpable feeling that these were indeed very holy and blessed places. The next day we woke early to go to the Ellora Caves. They became a UNESCO site in 1983 and extend over one mile (two kilometeres). 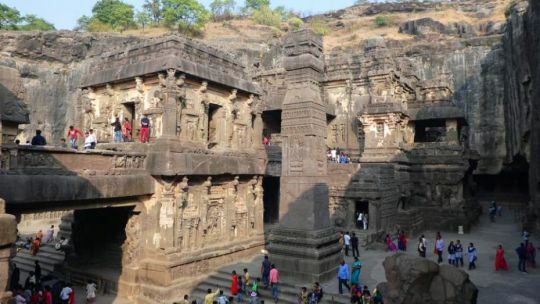 The cave monasteries and temples at Ellora were dug out of the vertical face of a cliff. It is one of the largest rock-cut monastery-temple cave complexes in the world, featuring Buddhist, Hindu, and Jain monuments and artwork dating from 600 to 1,000 C.E. Each of the thirty-four excavated caves depict deities and mythology, and contain viharas and chaityas. Hindu Kailasha temple at Ellora Caves, Maharashtra, India. December 2018. Photo by Pierre Yves. Twelve of the Ellora Caves are Buddhist, with one featuring a superb Maitreya statue. We sat quietly at that cave, doing practices and contemplating the greatness of these caves and what they would have been like in their day. These magnificent caves—unique in the history of humankind, as well as the extraordinary artwork and statuary, and what they represent—remain etched on my mind. 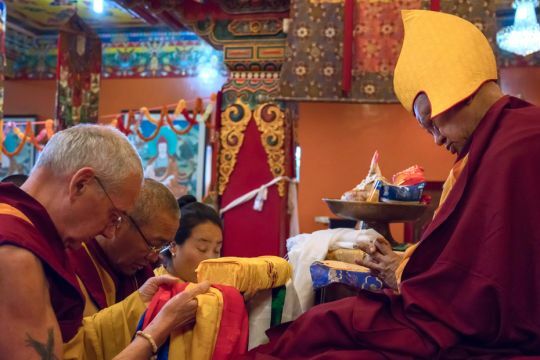 FPMT.org and Mandala Publications brings you news of Lama Zopa Rinpoche and of activities, teachings and events from over 160 FPMT centers, projects and services around the globe. If you like what you read, consider becoming a Friend of FPMT, which supports our work. Owen Cole offering the mandala to Ven. Tenzin Tsapel, Hayagriva Buddhist Centre, Perth, Western Australia, January 2019. Photo by Hayagriva Buddhist Centre. 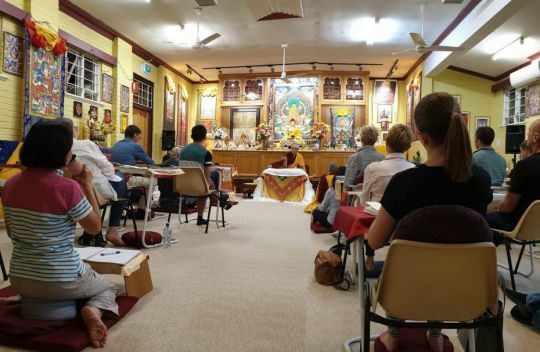 Hayagriva Buddhist Centre, an FPMT center in Perth, Western Australia, offered a six-week Buddhist Summer School program during the Australian summer, from January 8-February 10, 2019, consisting of teachings, meditations, and workshops led by Australian visiting FPMT registered teachers Ven. Thubten Dondrup and Ven. Tenzin Tsapel. This was Ven. Tsapel’s first visit to the center. Center member Owen Cole shares the story. 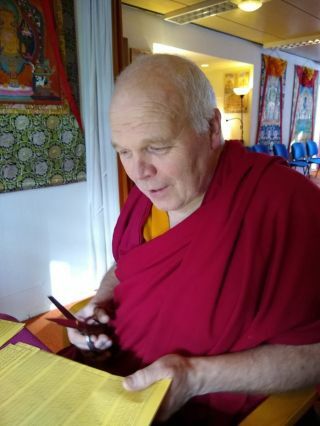 Geshe Ngawang Sonam, Hayagriva Buddhist Centre’s resident geshe, was on holiday, many people had leave for the summer holiday with time on their hands, so it was an ideal time for a Buddhist Summer School. Our center’s much loved former resident teacher, Ven. 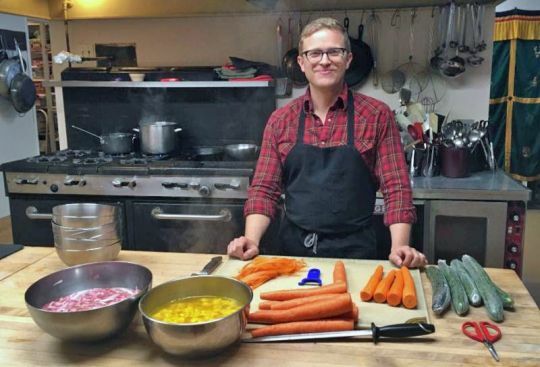 Dondrub, was in Perth for almost two weeks in January teaching from January 8-20, 2019, and Ven. Tsapel, who had never previously visited our center, came after him for a similar period, teaching from January 24-February 10. Ven. Tenzin Tsapel teaching at Hayagriva Buddhist Centre, Perth, Western Australia, January 2019. Photo by Hayagriva Buddhist Centre. Ven. Tenzin Tsapel has been ordained for 34 years, studied the Dharma at FPMT center Chenrezig Institute for 15 years, and taught at FPMT centers in a number of countries. It didn’t matter that most students didn’t know her as Ven. Tsapel’s warmth and down-to-earth manner captured the hearts of many students. Her program had something for everyone, from an explanation of Buddhist prayers and prostrations to teachings on the three poisonous minds and a Vajra Yogini self-initiation. 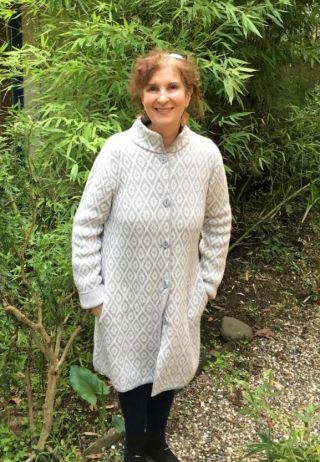 Long-time student and former spiritual program coordinator Susan di Bona found great benefit from having teachings from a woman’s perspective. “We are of similar age so there is already a feeling of sisterhood. Ven. Tsapel’s stories about the Dharma used life experience to illustrate points; this came more easily from a female teacher,” Susan said. One of our youngest students Zendra Giraudo said she found Ven. Tsapel accessible, and that she resonated with Ven. Tsapel more than other people. “Ven. Tsapel has a grounding presence which makes it easier to understand the teachings,” Zendra said. Another relatively new student, Penni Sutton, said she benefited from the way Ven. Tsapel linked the three poisonous minds of anger, greed, and ignorance, and that she really connected with Ven. Tsapel. “What I like about FPMT is that there are so many teachers and you get a little bit more with every teaching you receive,” Penni said. Ven. Tenzin Tsapel with Swee Lin Tan, Poh Choo Tan, Sau Chee Chiew, Cheryl Choong, Stella Low, and AK Ch’ng celebrating Australia National Day, Perth, Western Australia, January 2019. Photo by Hayagriva Buddhist Centre. A fundraising dinner and raffle for Machig Labdron Nunnery, which Ven. Tsapel is establishing, raised more than US$900. 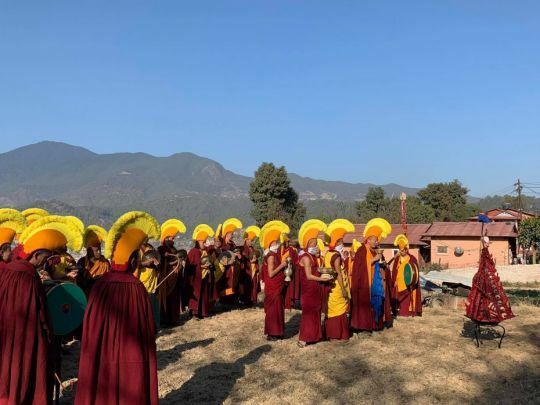 The nuns community will share a site in Bendigo with the Great Stupa for Universal Compassion, Thubten Shedrup Ling Monastery, and Atisha Centre, and so will be part of a Buddhist oasis in Australia. We thank Ven. Tsapel for the knowledge and time she gave us collectively and as individuals and would love to have her back. 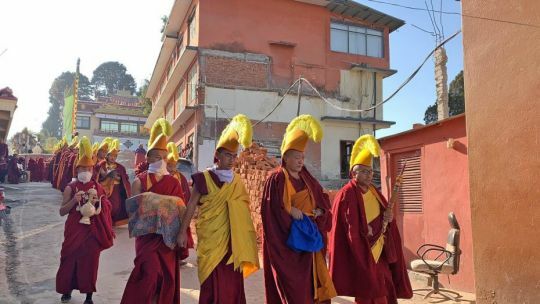 Kopan monks departing Kopan Monastery with a torma symbolizing Kalarupa, Kathmandu, Nepal, February 2019. Photo by Geshe Tashi Sherab. 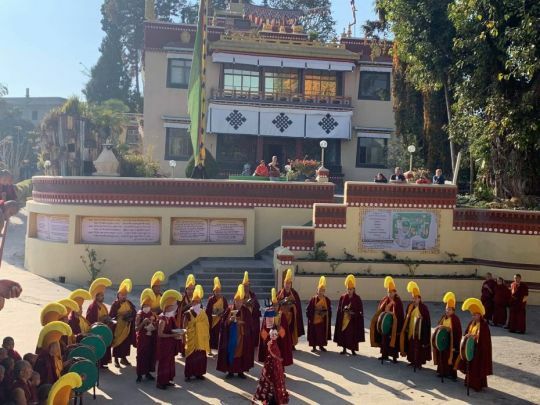 The community at Kopan Monastery, the FPMT monastery in Kathmandu, Nepal, shares about the annual Losar (Tibetan New Year) rituals that took place at Kopan in 2019. The Tibetan Losar tradition contains elements and values that we all share as human beings, and, similar to Western cultures, the New Year here means a fresh beginning. Losar rituals have many Buddhist elements, but Losar is primarily a secular event with its own flavor. At all the major monasteries, special ceremonies called Gyutor are performed on the last day of the year. The purpose of these ceremonies is to move into the new year with a clean slate after having purified the negativities of the past year. Kopan monks making offerings to a torma symbolizing Kalarupa, Kopan Monastery, Kathmandu, Nepal, February 2019. Photo by Geshe Tashi Sherab. At Kopan Monastery, the purification ceremonies start with an extensive puja by the tantric monks in which vast amounts of offerings are made to the protectors. A special torma symbolizing Kalarupa is consecrated, which will later be offered to the fire. 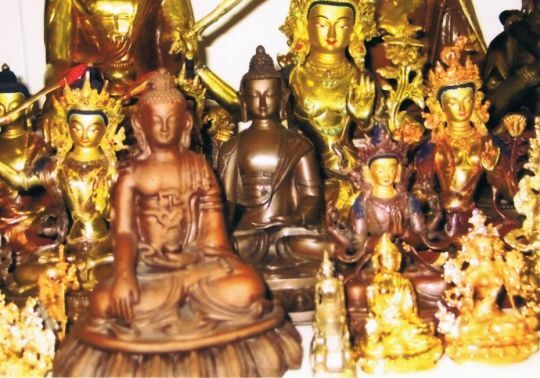 In the puja, extensive offerings are made, and all the protectors of the teachings of the Buddha are beseeched to fulfill the pledges they made in the past. The rituals continue with the assembly of the tantric monks in the Kopan Monastery courtyard, with the torma placed in the middle. The ritual master first performs an extensive tea offering to the protectors in which they are requested to remove all hindrances and obstacles. The tea offering is repeated four times, with the first one dedicated to the Lama, the second one to the Deity, the third one to all enlightened protectors, and the fourth to the worldly protectors and the landlords. Geshe Lhakpa, Geshe Thubten Jinpa, and a procession of Kopan monks departing Kopan Monastery, Kathmandu, Nepal, February 2019. Photo by Geshe Tashi Sherab. 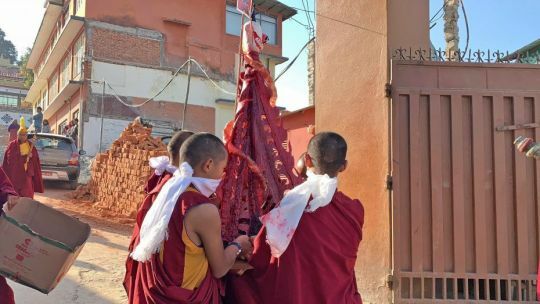 Following this, the torma is carried in a procession with music and chanting of prayers to a nearby field where a straw hut has been erected. The torma is then thrown into the burning straw hut, symbolically destroying all negativities and causes of negativities, the grasping and self-cherishing mind. Prayers are made for the removal of all obstacles to the teachings of Lama Tsongkhapa, and for the teachings to continue for a long time. Extensive dedications made to the torma symbolizing Kalarupa, Kathmandu, Nepal, February 2019. Photo by Geshe Tashi Sherab. Extensive dedications are made throughout the rituals. 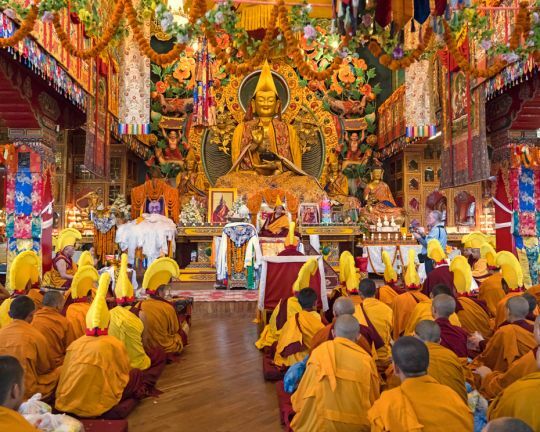 All FPMT centers, projects, services, and students are always included in the prayers to remove all obstacles and to have the right conditions to fulfill all the wishes of all the lamas, and in particular the wishes of His Holiness Dalai Lama and Lama Zopa Rinpoche. 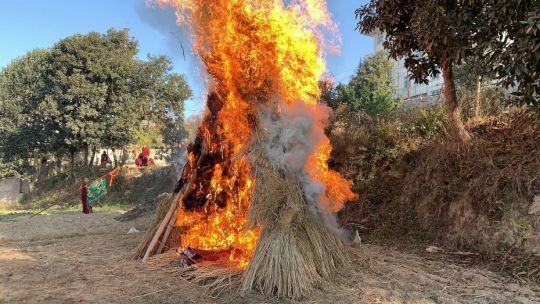 Fire in a bamboo and straw hut consuming a torma symbolizing Kalarupa, Kathmandu, Nepal, February 2019. Photo by Geshe Tashi Sherab. 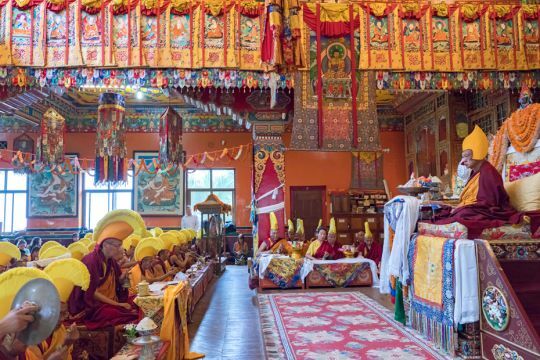 The next day is Losar, the New Year’s day, which is welcomed in the monasteries with a Palden Lhamo puja in the early morning, followed by a celebration of Guru Puja with extensive tsog offering at 8 a.m. This being the main puja of the New Year, it goes on until midday. Losar is mostly celebrated over three days. The first day is dedicated to the lamas. This is when lay people go to the monasteries to make offerings and visit their teachers to receive a blessing string. The monasteries celebrate this day as the first day of the Fifteen Days of Miracles. At Kopan Monastery this is also the anniversary of Lama Yeshe’s passing. The second day is dedicated to the king or leader of the country. The third day is then dedicated to the family. Guru bumstog, Tasmania, Australia, November 2018. Photo by Markus Ravik. 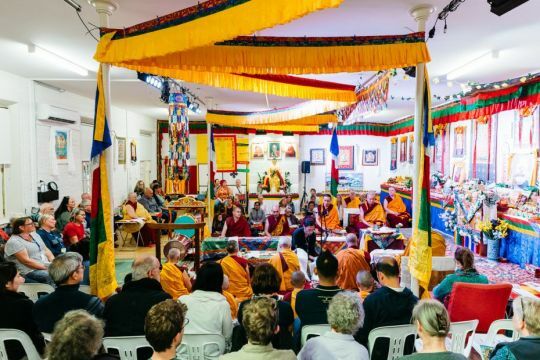 FPMT Sangha and students gathered together at the Kickstart Community Arts Centre in New Town, Tasmania, in November 2018 to make 100,000 tsog offerings to Guru Rinpoche, also known as Padmasambhava. 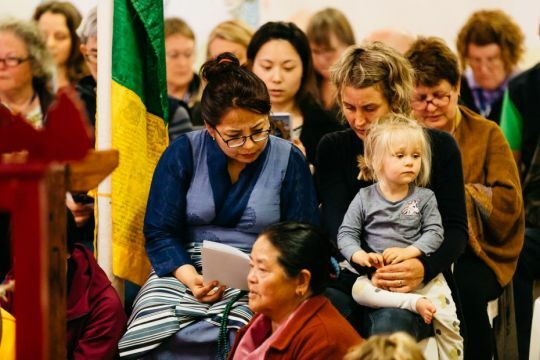 This was the second year in a row that the FPMT Australia National Office organized and FPMT center Chag Tong Chen Tong Centre, Tasmania, co-hosted a Guru bumtsog. 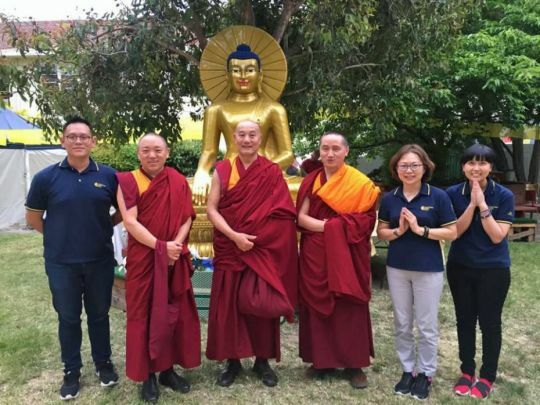 They were assisted in the months leading up to and during the event by students and executive committee members from Logsang Dragpa Centre, the FPMT center in Selangor, Malaysia. This created a warm, FPMT global family feeling at the four-day event. FPMT center Vajrayana Institute student Shannon Murphy shares the story. An auspicious annual event took place in a suburb of Hobart, Tasmania, in November 2018. Geshe Thubten Rabten, the FPMT resident geshe from Atisha Centre and Thubten Shedrup Ling Monastery; Geshe Phuntsok Tsultrim, the FPMT resident geshe from Chenrezig Institute; and Geshe Tenzin Zopa, an FPMT touring geshe were among eighteen ordained Sangha and more than one hundred men, women, and children from FPMT centers all over Australia and beyond who came together for a Guru bumtsog. Guru bumtsog, Tasmania, Australia, November 2018. Photo by Markus Ravik. The event honored Guru Rinpoche an 8th-century Buddhist master from India who played an essential role in the flourishing of Buddhism in Tibet. He represents an embodiment of the Dharma lineage, so that the ritual of making offerings to Guru Rinpoche was an offering to all our precious teachers, notably His Holiness the Dalai Lama and Lama Zopa Rinpoche, and an offering to the Buddha potential within every being. We kept in mind all those who suffer in the cycles of life, death, and the bardo, in all realms of existence. With this expansive view, the aspiration was to make 100,000 tsog offerings and 100,000 mantra recitations during our four days together! Geshe Phuntsok Tsultrim, Ven. Thubten Dondrub, Ven. Tenzin Tsapel, and Ven. Tenzin Chodron at the Guru bumtsog, Tasmania, Australia, November 2018. Photo by Markus Ravik. Geshe Tenzin Zopa led the prayers and mantras, inspiring us with heart-felt motivations and rotating chant tunes with support from Geshe Thubten Rabten. Geshe Tenzin Zopa and Ven. Lozang Sherab—who sometimes assists at FPMT center Langri Tangpa Centre—offered music on the big brass cymbals. Ven. Thubten Chokyi and Ven. 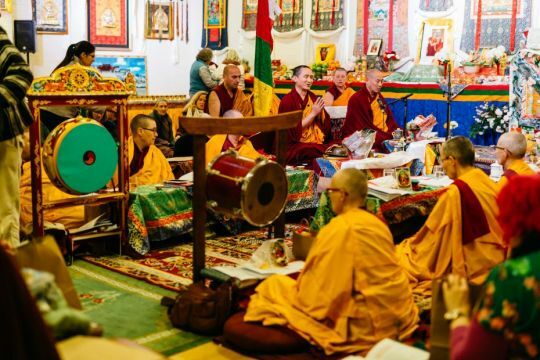 Lozang Thubten from FPMT center Chenrezig Institute offered music on the drums. It created a powerful practice that, once we got our tongues around the Tibetan, could really carry the mind into an expansive offering. The practice sessions were solid blocks of mantra recitation that lasted for a couple of hours each, five sessions a day. Chag Tong Chen Tong Centre director Ven. 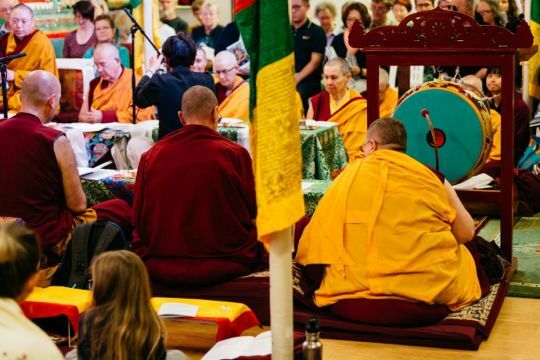 Lindy Mailhot, FPMT Australia national coordinator Peter Stickels, and education coordinator Stephanie Brennan making the offerings at the Guru bumtsog, Tasmania, Australia, November 2018. Photo by Markus Ravik. To refresh us between sessions, we were generously catered for by the Chag Tong Chen Tong Centre community, with a variety of hot drinks, delicious pastries, and freshly prepared breakfasts and lunches. Participants caught up with old friends and met new ones. Some took time to do personal meditation or to visit the exhibition of holy artworks curated in the art center by artist Martin Watson Walker. Ven. 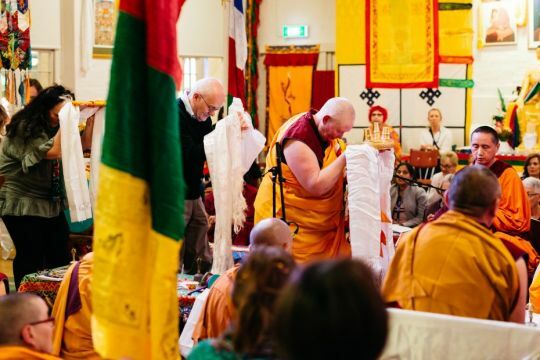 Tenzin Sherab, Mary Richards, and Martin Walker-Watson making offerings to the Buddha at the Guru bumtsog, Tasmania, Australia, November 2018. Photo by Markus Ravik. A large Buddha Shakyamuni, one of the preliminary sculptures made for the Jade Buddha for Universal Peace, was positioned in the heart of the garden for guests to circumambulate and make light, incense, water bowl, and Sur offerings to, while stupas, thangkas, relics, and extensive offerings were arranged in the hall. Martin oversaw the gilding of the beautiful Buddha so that participants could make offerings of gold leaf. Placed around the centerpiece were hundreds of water bowls, which gradually filled with multicolored blossoms. Incense billowed and candles flickered. When the rain came down the monks and nuns led the congregation under umbrellas to offer Sur prayers before the dusk settled. Gavyn Teh, Losang Dragpa Centre (LDC) program support and setup, Geshe Phuntsok Tsultrim, Geshe Thubten Rabten, Geshe Tenzin Zopa, Candy Tan, LDC spiritual program coordinator, and Lua Chiew Fei, LDC assistant spiritual program coordinator, Tasmania, Australia, November 2018. Photo courtesy of Candy Tan. One participant commented that for years he had kept getting blocked in his study of Dharma. He found incorporating prayer and mantra into his practice has been instrumental to opening his mind. When we put all the busy demands of life aside and focus on our intention to create the causes for the elimination of all suffering, that all beings receive all the conducive conditions that will lead to an enlightened state, what an incredible practice of compassion it becomes! All the more inspiring to do it in a group setting where there where more than one hundred people were sharing a space and an intention to put good energy out into the world. Students participating in the Guru bumtsog, Tasmania, Australia, November 2018. Photo by Markus Ravik. 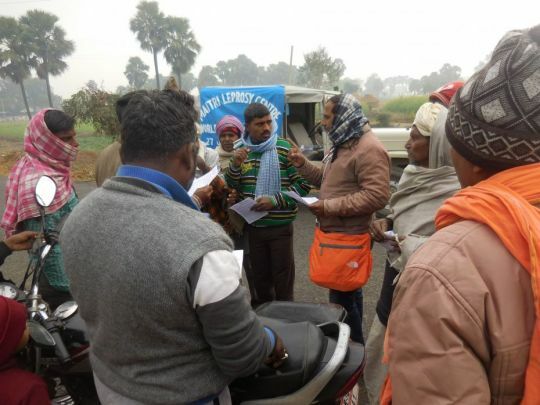 MAITRI field coordinator Binod Patra and teacher Ganesh Sharma raising awareness about leprosy in a village, Gaya District, Bihar, India, February 2019. Photo by MAITRI. FPMT project MAITRI Charitable Trust in Bodhgaya, Gaya District, Bihar, India, celebrated World Leprosy Day on January 27, 2019. The day’s activities included a visit to MAITRI’s leprosy awareness stall by Lama Zopa Rinpoche. MAITRI’s director, Adriana Ferranti, shares the story. World Leprosy Day is not only a day of reflection on the victims of this devastating disease. It is first and foremost a day of solidarity with our brothers and sisters who are afflicted by it. Leprosy is still widespread in India and particularly in Bihar. It can affect anybody: rich and poor; high and low caste; male and female; child and adult; educated and uneducated. MAITRI leprosy patients Shankar Mahto, Kamlesh Manjhi who was discharged in February 2019 after more than two months of treatment, and Ramswaroop Paswan, MAITRI, Bodhgaya, Gaya District, Bihar, India, February 2019. Photo by MAITRI. Leprosy is a communicable disease, but one of the least contagious ones. It is caused by the germ Mycobacterium leprae; it is neither hereditary nor a curse. If left untreated, the intense inflammation that causes severe swelling of the person’s features can lead to permanent scars and deformities. However, if treated with regular care and medication, the recovery can be full. 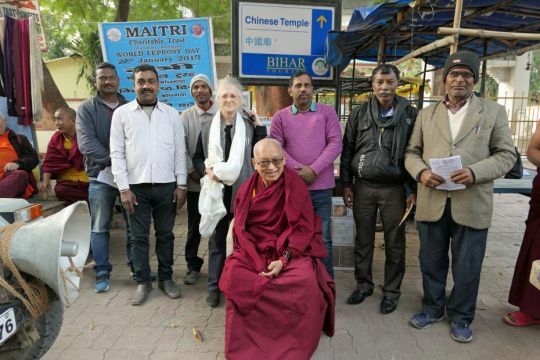 Lama Zopa Rinpoche visiting MAITRI’s leprosy awareness stall near the Mahabodhi Temple, Bodhgaya, Gaya District, Bihar, India, February 2019. Photo by Ven. Roger Kunsang. MAITRI’s celebration of World Leprosy Day traditionally consists of an awareness campaign about the disease and its treatment in most provinces of Gaya District. Two teams of paramedical workers travel on two jeeps equipped with loudspeakers, heading to different destinations in the district, visiting villages in forgotten corners of the hinterland. The workers interact with the population, distribute leaflets, and possibly detect new cases. 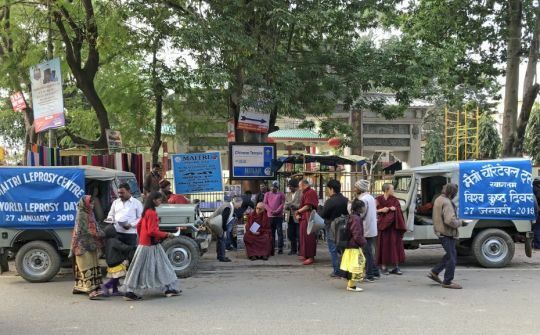 By 3 p.m., both jeeps converge at our stall in Bodhgaya, where a worker has kept the MAITRI stall open since early morning. 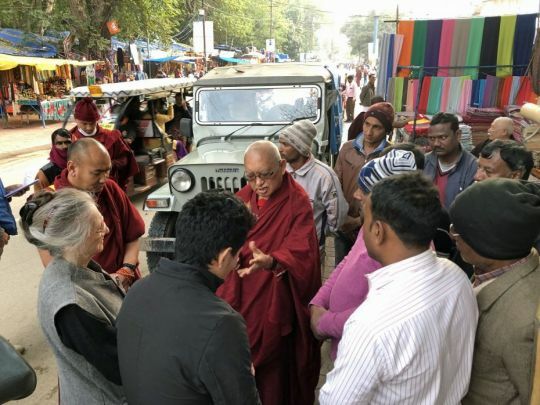 All field staff—joined by the teachers and myself—continue addressing the public and distributing leaflets until 5 p.m.
Lama Zopa Rinpoche advising Adriana Ferranti and MAITRI staff, Bodhgaya, Gaya District, Bihar, India, February 2019. Photo by Ven. Roger Kunsang. On the teams’ return to the campus, the celebration ends with the distribution of samosas and sweets to MAITRI inpatients, the living representatives for whom MAITRI was created almost thirty years ago. In 2018 we assessed 586 high risk cases; instructed 792 disabled cases for self-care; and trained 576 deformed patients, 2,983 community members and 417 government staff members. MAITRI held thirty-four camps to distribute sandals and dressing kits. We assisted the government with bi-monthly leprosy sections at the government-run public health clinics and carried out education programs across the region. At MAITRI Hospital fifty-nine ulcer cases and two reaction cases have been admitted. Lama Zopa with Adriana Ferranti and MAITRI staff, Bodhgaya, Gaya District, Bihar, India, February 2019. Photo by Ven. Roger Kunsang. 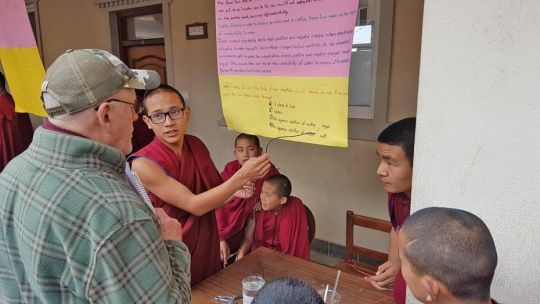 For the seventh year, due to the kindness of a benefactor, the FPMT Social Services Fund has been offering substantial grants to MAITRI in support of their incredible and compassionate work and service. Kopan Monastery School student Ven. 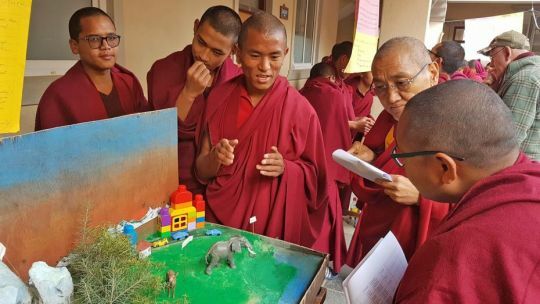 Lobsang Yonten explaining his team’s project to Khen Rinpoche Geshe Thubten Chonyi and Geshe Thubten Jinpa at the school’s Science Fair, Kopan Monastery, Kathmandu, Nepal, January 2019. Photo by Geshe Tashi Sherab. 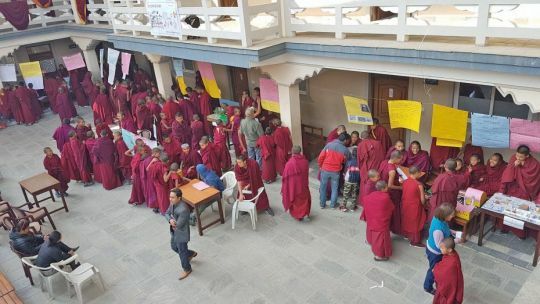 On Sunday, January 13, 2019, Kopan Monastery School at FPMT’s Kopan Monastery in Kathmandu, Nepal, held their second-ever Science Fair. They invited the local community to come to the monastery to talk with the students and learn about their group projects. Kopan Monastery School Headmaster Geshe Tashi Sherab shares the story. Although we have had a science class at Kopan Monastery School since the very beginning of the school’s founding in 2009, last year was the first year we held a Science Fair. Kopan Monastery School Science Fair, Kopan Monastery, Kathmandu, Nepal, January 2019. Photo by Photo by Geshe Tashi Sherab. I think it’s very important not only to give students theoretical explanations, but to also engage the students in projects which depend on teamwork. Kopan Monastery School student Ven. Lhundub Pelkar explaining his team’s project at the school’s Science Fair, Kopan Monastery, Kathmandu, Nepal, January 2019. Photo by Geshe Tashi Sherab. This Science Fair was all the result of their teamwork. They had been working on it for more than a week. I am amazed to see their passion and efforts. All of the students—including our youngest students who are seven years old—are involved in these events. 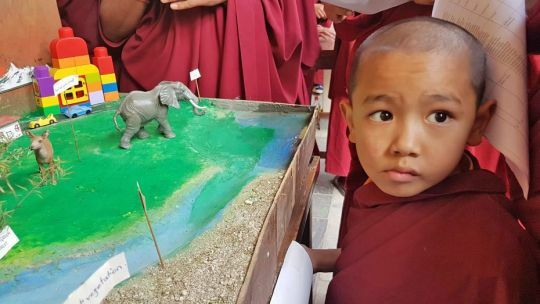 Thubten Rigsel Rinpoche exploring the Kopan Monastery School Science Fair, Kopan Monastery, Kathmandu, Nepal, January 2019. Photo by Geshe Tashi Sherab. The reasons we teach science to our Buddhist monks is as follows: both science and Buddhism are looking for the truth—whatever it may be. We use philosophical methods and scientists use experiments to discover the truth. So, if we can learn the methodology of science, it is going help us a lot. That’s why we feel it is very important to introduce science to our students. Kopan Monastery School students Ven. Lobsang Choezin and Ven. 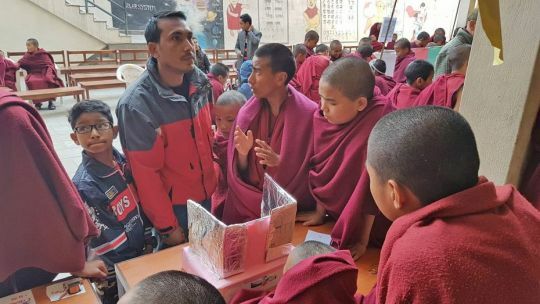 Lobsang Jampa explaining their team’s project at the school’s Science Fair, Kopan Monastery, Kathmandu, Nepal, January 2019. Photo by Geshe Tashi Sherab. 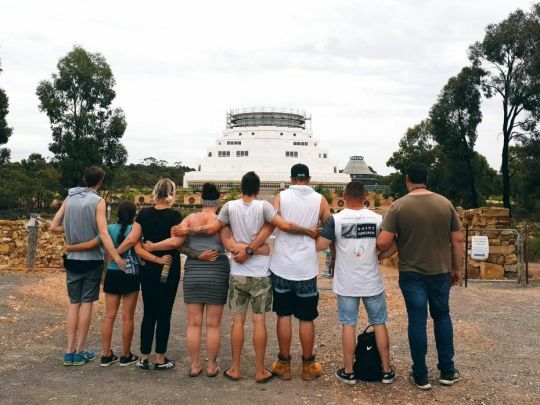 Alcohol and Other Drugs Program participants gazing with arms locked at the Great Stupa of Universal Compassion, Bendigo, Australia, January 2019. Photo by Alyce Crosbie. 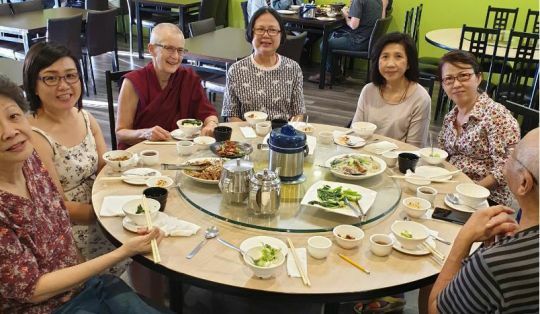 The Great Stupa of Universal Compassion, a FPMT project near Bendigo in Victoria, Australia, has been running an Alcohol and Other Drugs Program for the past several months. Community service is one of the five FPMT Pillars of Service. Participants in the Salvation Army Bridge Program—a live-in six-week recovery program for men and women with an alcohol and/or drug addiction—visit the Great Stupa of Universal Compassion (the Great Stupa) once every two weeks for art therapy, mindfulness, and meditation activities. Participants occasionally have the opportunity to ask questions of a Buddhist nun from the FPMT community. Rhiannon Charles, a tour guide at the Great Stupa who initiated the Alcohol and Other Drugs Program shares the story. I’ve been running this program for six months now, and the response from participants has just been amazing. Participants have told us that they have gained new skills, and will continue with their mindfulness and meditation practices even after they leave the program. This well-being program here at the Great Stupa helps our participants voluntarily make the right choices to improve health and well-being. It encourages participants to become more self-aware, provides participants with better skills to cope with the various difficult life situations and problems that confront them, and gives back to the community in a wholesome way. One of our Alcohol and Other Drugs Program participants shared their experience with us. “From seventeen years of addiction coming to the Great Stupa and being a part of this program, I finally connected with myself for the first time. This program has inspired me to look into Buddhism, and opened me up to change aspects of my life. I will continue to practice mindfulness and meditation outside of the program, and I will be returning to the Great Stupa once I’m no longer in the program. After losing my daughter to cot death (sudden infant death syndrome), I have been searching for some answers as to what happens to us in the afterlife. Having the chance to engage with a Buddhist nun and getting insight into a Buddhist understanding of the afterlife, I now feel more at ease. It has helped me immensely.